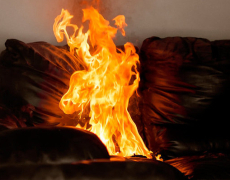 CAL 133 or TB 133 is a fire regulation that regulates upholstered furniture and any other upholstery within a commercial setting. Typically, this code is what restaurants, hotels and other public-areas in commercial buildings need to adhere to. At Furniture Concepts, we are Boston CAL 133 specialists, and have fabricated millions of dollars worth of Boston CAL 133 furniture since our launch in 1994. In order for a piece of furniture to comply with CAL 133, a full-scale burn test must be executed and those results provided to the fire department for approval. All furniture that meets code must also be labeled to show compliance, but oftentimes a permit is required by the local fire department, where they will review full-scale burn tests as well as fabric flame information. CAL 133 was originated in California, but other states have begun to adopt its guidelines, as its currently the strictest in the nation.